I've been checking the serum osmolal gap on patients with toxic ingestion for years. However, the osmolal gap has yet to crack a case for me. There have been lots of patients with elevated osmolal gaps due to uremia or ketoacidosis. Meanwhile, the cases of ethylene glycol or methanol intoxication which I have encountered have been diagnosed based on other features (e.g., history of antifreeze ingestion, anion gap acidosis, crystalluria). This raises the question: What is the performance of the serum osmolal gap? Is this an evidence-based test for intoxicated patients? 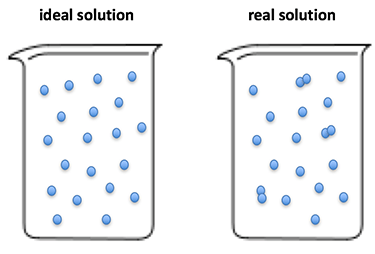 In an ideal solution, every molecule would stay by itself, thereby increasing the osmolality of the solution by the same value. Unfortunately, in reality some molecules will stick to each other (for example a positive and negative molecule may be held together by electrical forces). This decreases the effective osmolality of the individual molecules, because suddenly two molecules are only contributing one “effective” particle to the solution. Whenever these many equations are created to answer a single question, it means that none of them actually works. To date there is no consensus regarding which equation is best (a new equation was just released this year!). 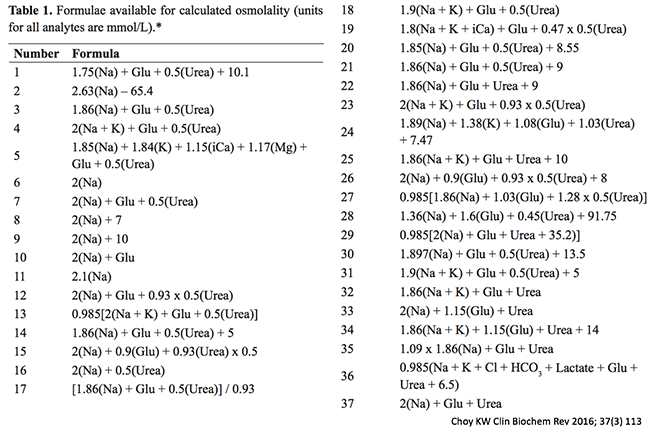 To make matters murkier, there also isn’t consensus about the upper limit of a normal osmolal gap (>10 mOsm? >15 mOsm?). To make matters even worse, a single equation will perform differently in different settings. Over time, newer methodology has caused shifts in normal values (figure above). Performance also varies between different laboratories (Kraut 2015). This might explain why no single unifying equation has yet been found – it may be impossible for a universal equation to ever exist. Most formula for osmolal gap have a “normal” value that ranges over a span of ~20 mOsm/L (e.g., from -10 to +10 mOsm/L; Liamis 2017). An ethylene glycol level >20 mg/dL is regarded as potentially toxic and requiring antidotal therapy with fomepizole. This corresponds to an osmolal shift of only ~3 mOsm. Imagine a patient has an ethylene glycol level of 23 mg/dL. Unless the patient's baseline osmolal gap was on the high side (>7 mOsm/L), this difference would remain hidden within the normal range of serum osmolality. Indeed, if the patient's baseline osmolal gap was low at baseline (say, -8 mOsm/L), then the patient could acquire an ethylene glycol level >100 mg/dL despite a normal osmolal gap. Most of these disorders cause only moderate elevations in the serum osmolal gap. Therefore, increasing the cutoff for an abnormal osmolal gap to >20-30 mOsm/L would improve its specificity for toxic alcohol ingestion. However, this would destroy the sensitivity. Evidence: performance of the serum osmolal gap for toxic alcohol poisoning. There are no large prospective studies evaluating the performance of osmolal gap to detect toxic alcohols. The best available evidence seems to be two retrospective studies, which are briefly explored here. This was a retrospective study based on records from a single hospital between 1996-2010. Charts were obtained from patients who received an ethanol volatile panel (which consisted of simultaneous electrolytes, ethanol level, and serum osmolality). Osmolal gap was calculated using the formula below. Charts were also reviewed for direct measurement of toxic alcohol levels using gas chromatography. 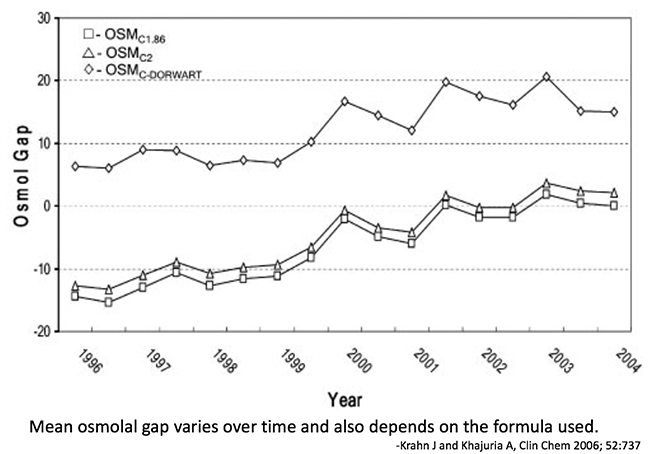 It is impossible to reach any conclusion about the sensitivity or specificity of osmolal gap based on this data. Very few patients received definitive testing for toxic alcohols. For example, measurement of toxic alcohol levels required approval of the pathology resident, which was largely based upon the presence of an osmolal gap. 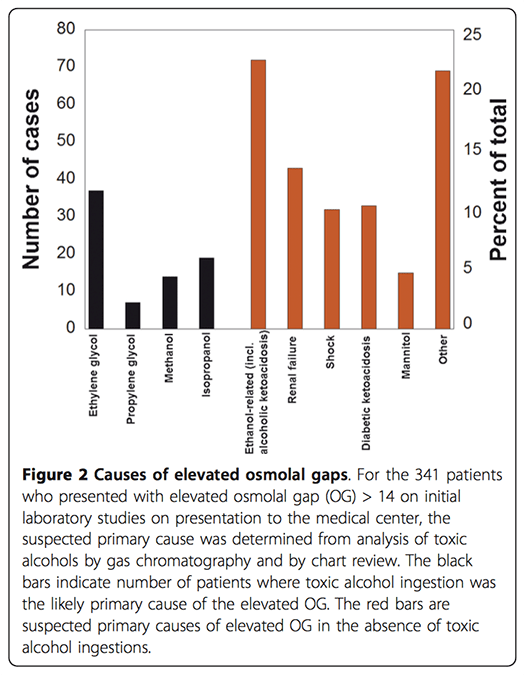 Among patients with a normal osmolal gap, only 55/20,151 (0.3%) received complete testing for toxic alcohols. It is unknown how many of the remaining 97.7% of patients might have had undiagnosed toxic alcohol ingestion. Among 341 patients with an osmolal gap >14 mOsm, charts were reviewed to determine the cause. As shown below, only 58 of these patients (17%) were ultimately diagnosed with ethylene glycol or methanol poisoning. This suggests that the osmolal gap may have a fairly poor specificity (even with a relatively high cutoff of >14 mOsm). This was a retrospective study based on records from two hospitals between 1996-2002. Charts were obtained from patients who received simultaneous measurement of electrolytes, ethanol, osmolality, ethylene glycol, and methanol. The performance of the osmolal gap was tested using two equations (below), using a cutoff of either >10 or >20 mOsm/L. 131 patients were included, of whom 20 had levels of ethylene glycol and/or methanol above a level requiring fomepizole. The performance of various equations is shown below. The two equations produced statistically different results, showing that the choice of equation matters. One weakness of this paper is that it retrospective. The rate of detection of toxic alcohols is high (26%), suggesting that the clinicians were very selective about who to test. Such selectivity could affect test performance (e.g. if clinicians avoided testing patients with uremia, this would remove false-positives from the study and increase specificity). Let’s examine how the osmolal gap will work in two common clinical scenarios. This discussion will use the best set of test performance reported by Lynd et al. (Equation #2 with a cutoff of >10 mOsm/L, yielding a positive likelihood ratio of 1.68 and a negative likelihood ratio of 0.30). Imagine a patient presenting with undifferentiated intoxication, without any history suggestive of a toxic alcohol ingestion. The likelihood that this patient has a toxic alcohol ingestion is low. Krawsowski 2012 detected a toxic alcohol in 0.3% of these patients (~1/300), which is consistent with large-scale toxicology data (Watson 2004). A normal osmolal gap decreases the probability to 0.09%, excluding a toxic alcohol ingestion. That’s nice, but it doesn’t really help us. Nobody really expected the patient to have a toxic alcohol ingestion in the first place. Therefore, excluding it won’t affect management. An elevated osmolal gap increases the post-test probability to 0.5%. Therefore, a positive result is overwhelmingly likely (99.5%) to be a false-positive result. This shows that osmolal gap isn’t specific enough to be used as a screening test in a low-risk group of patients. The negative and positive predictive values of the osmol gap are too poor to recommend this test to routinely screen for xenobiotic ingestion -Charney AN and Hoffman RS, in Goldfrank's 10th edition. A positive result increases the post-test probability of toxic alcohol exposure to 63%. This doesn’t change things much. If the osmolality machine were broken, we would give this patient fomepizole and order toxic alcohol levels. If we detect an elevated osmolal gap, our management is exactly the same. A negative result decreases the post-test probability of toxic alcohol exposure to 23%. This is where things get dicey. Based on a normal osmolal gap, there might be a temptation to say that toxic alcohol has been “excluded’ and therefore fomepizole isn’t needed. However, a 23% likelihood of toxic alcohol ingestion is still high enough to justify fomepizole administration. Therefore, it is possible that a normal osmolal gap could be falsely reassuring in a patient with high pre-test probability of toxic alcohol ingestion. There are a variety of innovative tests under development to detect methanol, ethylene glycol, or their toxic metabolites. For example, one promising assay evaluates ethylene glycol based on its reaction with a bacterial enzyme, glycerol dehydrogenase. Quantitative and qualitative point-of-care versions of this test are currently available for veterinary use (Rooney 2016, Robson 2017). Although serum osmolal gap is a poor test for toxic alcohol ingestion, the disease itself is uncommon. Therefore, our diagnostic failure rate is low (perhaps ~1/1,000 intoxicated patients). Missed diagnosis may be devastating for an individual patient. However, a low error rate among a marginalized patient population won't gain much attention (1). Thus, it's possible that veterinarians will continue to out-perform us on this diagnosis. There is disagreement regarding the best formula to calculate the osmolal gap, and what the appropriate cutoff value should be. Most patients with an elevated osmolal gap don’t have toxic alcohol poisoning. Osmolal gap may be increased by numerous factors including renal failure, ketoacidosis, shock, electrolyte abnormalities, and contrast dye. Performance of the osmolal gap to detect toxic alcohols varies widely depending on the equation used and laboratory techniques. A recent study suggests that it might have a positive likelihood ratio of ~1.2-1.7 and a negative likelihood ratio of ~0.3-0.45. These performance characteristics are inadequate for broad clinical use, with the potential for frequent false-positive and false-negative results. The use of osmolal gap as a diagnostic test for toxic alcohols is poorly supported by available evidence. If a new test were developed with this level of evidentiary support, there is no way it would gain FDA approval. You don't understand the osmolal gap (EMNerd) – This post explores some important aspects of the osmolal gap not covered here, including why it may be falsely normal among patients with a delayed presentation following toxic ingestion. If 1/1000 patients with STEMI were missed for some reason, this would probably generate widespread panic, lawsuits, and the development of a new supersensitive troponin assay or 24-lead EKG. However, intoxicated patients are often marginalized and under-advocated, so these missed diagnoses are less likely to generate institutional or professional ire. Josh is the creator of PulmCrit.org. He is an assistant professor of Pulmonary and Critical Care Medicine at the University of Vermont (Burlington Vermont, USA). Thanks Cliff! That means a lot coming from the man who invented the term dogmalysis. Veterinarians and Canadians… while rotating through the NYCPCC as a Canadian resident I was surprised to discuover the unavailability of in house toxic alcohol assays. Turn around time averaged 7-14 days making the test academic rather than helpful. We are fortunate in most centers in Canada to have rapid turn around time (average 2h) on toxic alcahols. There still ocassionally is an issue with clinicians understanding how the osmolar gap can be misleading and so you can usually expect a call from your hospitals medical biochemist before getting the test released in those cases. The other consideration and challenge with using the osmolar gap not illucidated above is of course the natural history and pharmacokinetics of toxic alcohol ingestion which is one of metabolism of the active osmol to the respective acid and then terminal metabolite. As this occurs the measured osmolality falls and the anion gap increases. So time from ingestion will reduce the sensitivity further of the osmolar gap at any cut off. Thanks for another fantastic post! thank you, Josh! that was a very good, detailed review. Very good details and great job who read and think this article. Congrats !